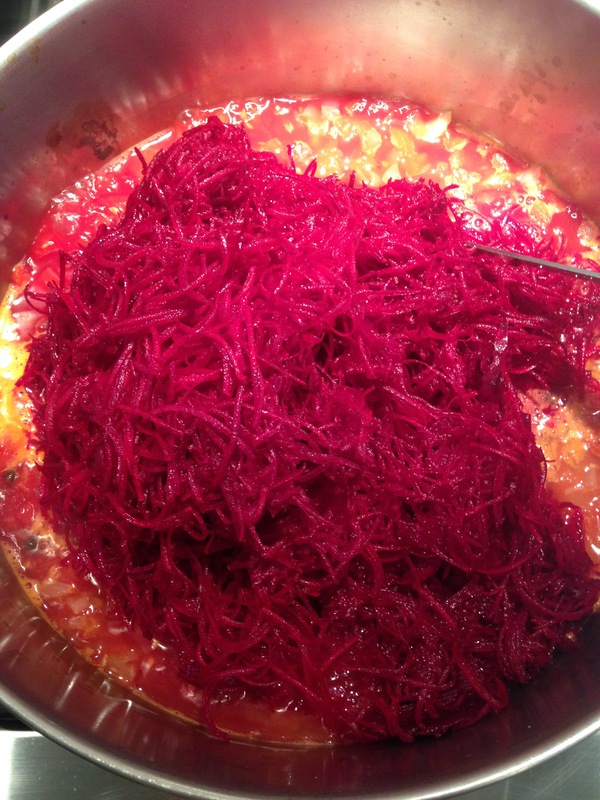 Above is a beet soup made with grated beets and no greens and below it a beet soup with julienne sliced beets and greens. Same recipe, but different beet prep. The recipe makes about 4 1/2 quarts. 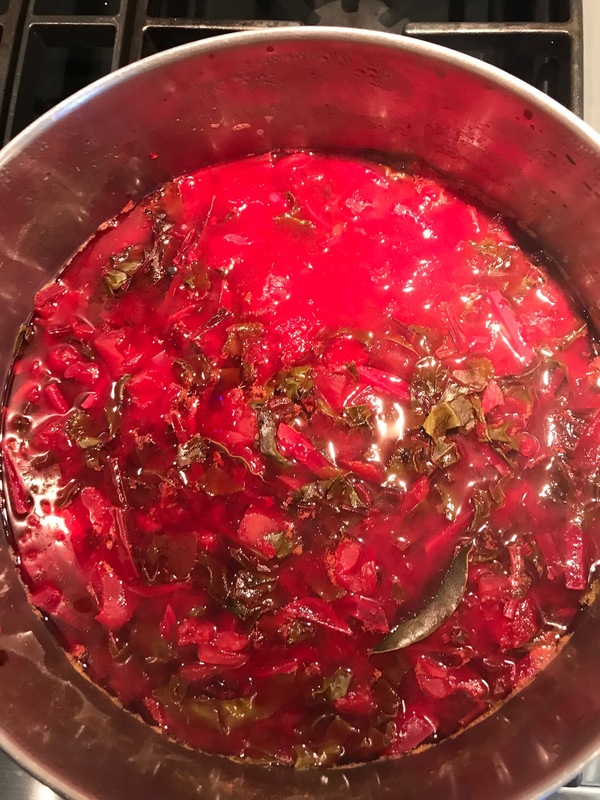 I have made many variations of beet soup, also known as borsht. Borsht is a Russian soup that’s a mixture of vegetables including beets, cabbage, carrots, tomatoes, potatoes and possibly other veggies. 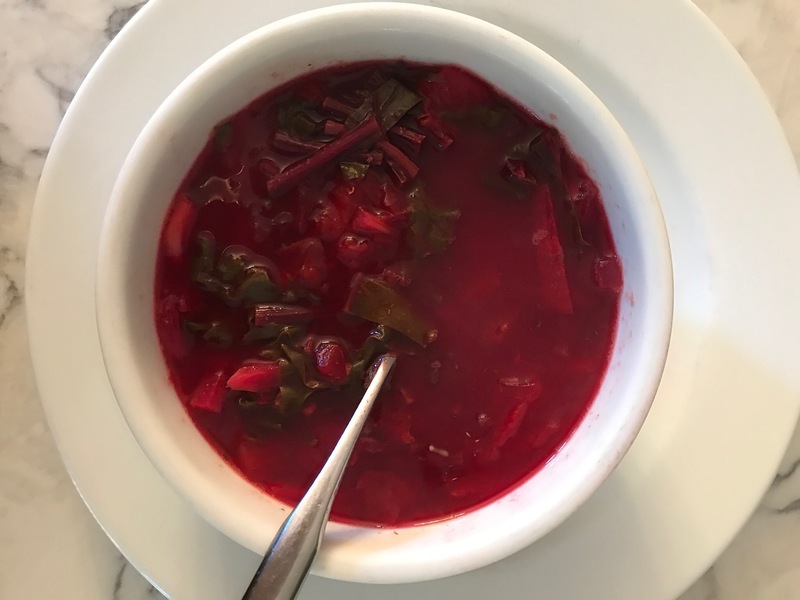 The bright color of beets gets muted when cooked with other vegetables, so I like to make this beet soup with only beets, tomatoes and some onion in a vegetable broth with added spices. It’s really so simple. 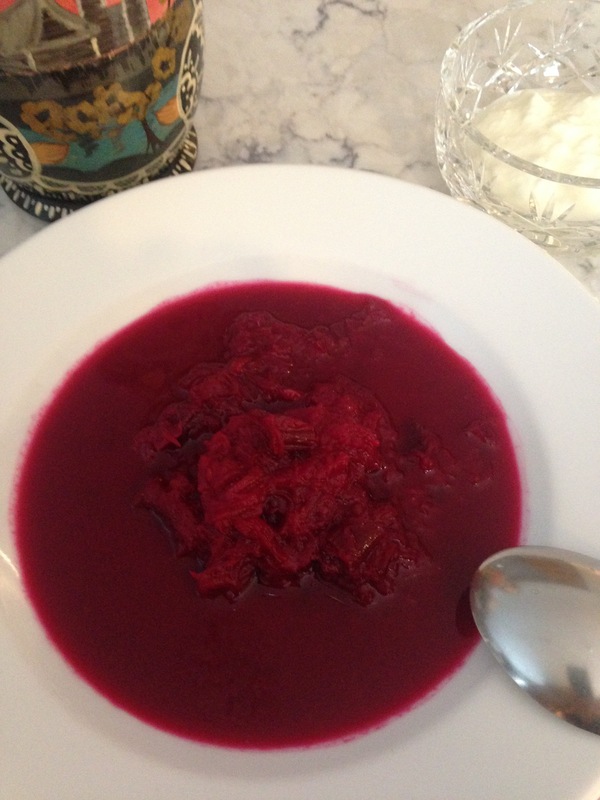 And the big surprise is that this beet soup tastes delish hot or cold! Cold soup in the summer is so refreshing! We had dinner in Chicago at the Russian Tea Time. It’s much more than a tea room. Their menu is full of hearty Eastern European fare! 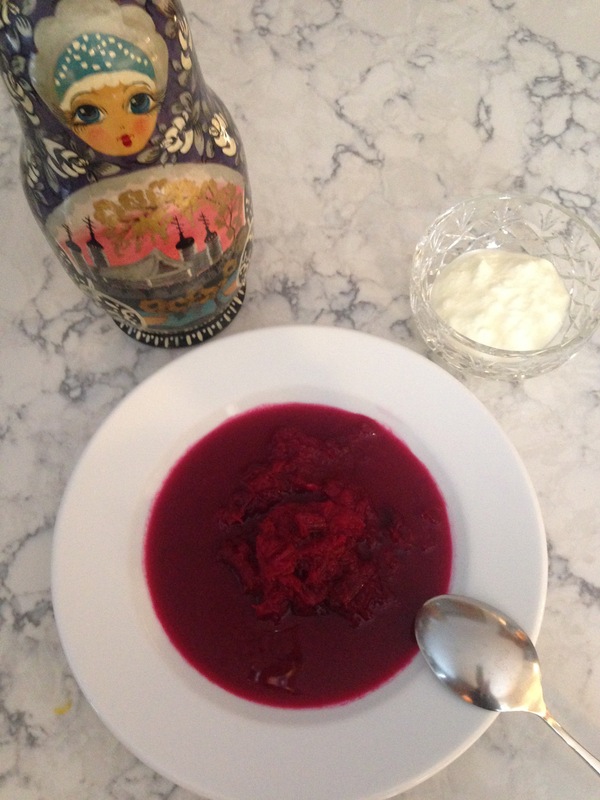 Their borsht was a beautiful red of grated beets and carrots which inspired me to develop this recipe for Beet Soup! 16 cups (64 oz) unsalted vegetable stock, low salt if possible if using store bought stock. Stock is better than broth! 2 – 28 oz cans diced tomatoes in juice, not sauce! 1/2 teaspoon hot red pepper flakes. This adds a fair amount of heat. Use less if you don’t want it hot. 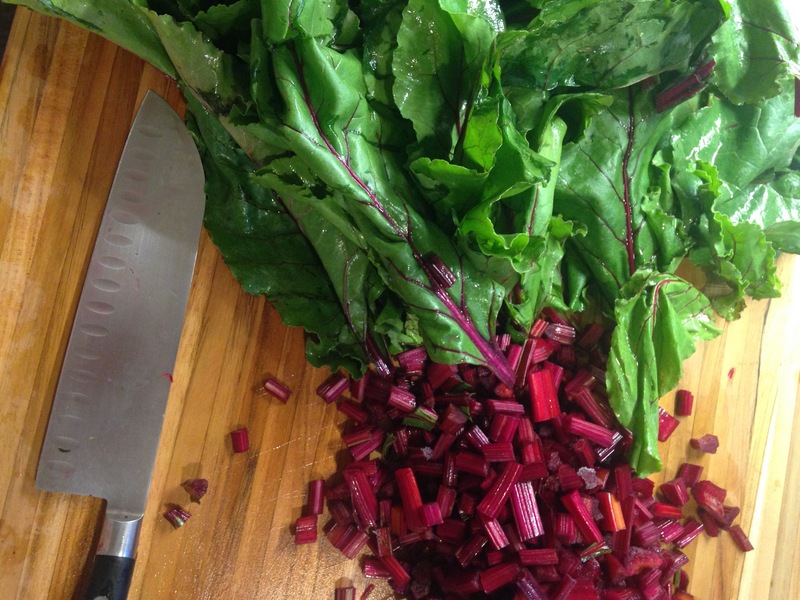 Trim off stems and leaves from beets. Reserve the stems. Use the leaves to make a Beet Salad. Look up my recipe. Or cut the greens in julienne strips and add to the soup at the very end. Wash the stems and cut them into 1/2 – 1 inch lengths. Set aside. Soak beets in water and scrub clean. Peel beets with a vegetable peeler. Grate them with a food processor or Kitchen Aid attachment or slice and then cut into julienne strips. Set aside in a bowl. Meanwhile, in a large 12 quart stock pot, heat the stock. Add onion and tomatoes to the stock. Add bay leaves, garlic, allspice, coriander, and hot pepper flakes. Cover and bring to a boil and simmer 20 minutes. Add the beets and stems to the soup. Bring to a boil and simmer on low for 10 minutes. Add sugar, red wine vinegar, and dill. Cover and simmer 5 minutes. Add greens if you like. Cool and store in the frig for a full 24 hours so the flavors meld. Float sour cream or plain yogurt on each bowl if you like. But you’ll lose some of the bright red color! This is traditional, but not necessarily always used. 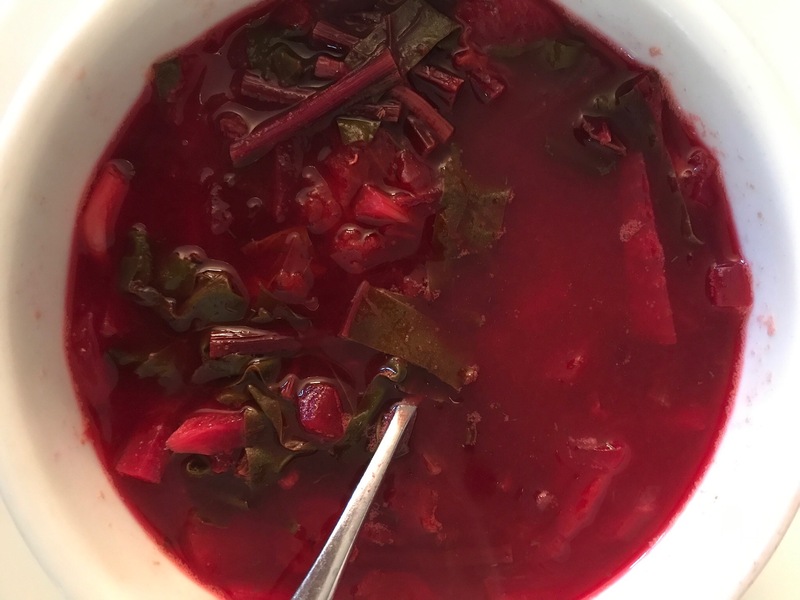 This beet soup is made with julienne strips of beets and the greens. 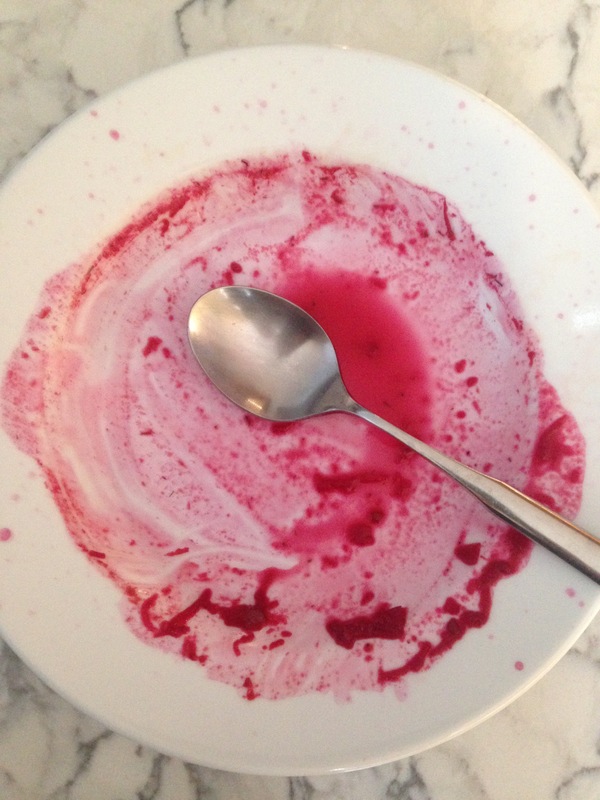 Empty bowls of beet soup offer a beautiful color that’s even pleasing to look at! Posted in soups and tagged antioxidants, beets, beetstems, borsht, calciumrichfood, osteoporosis, vegan, vegetarian. Bookmark the permalink.